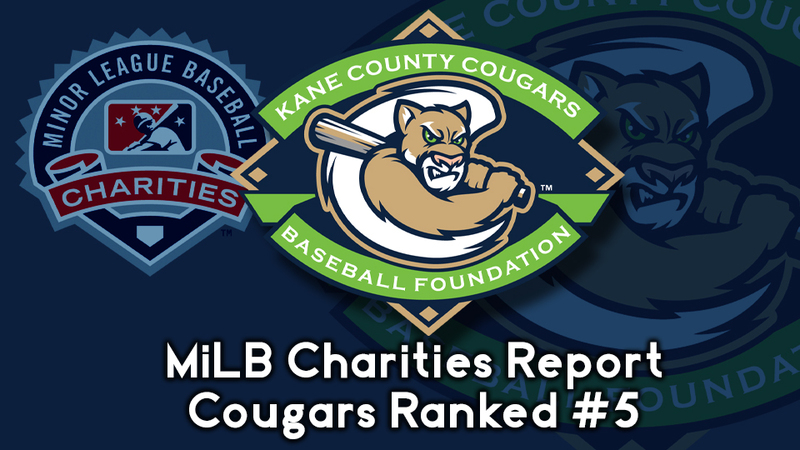 GENEVA, Ill. - The Kane County Cougars have been ranked #5 among all 160 Minor League Baseball (MiLB) teams for their charitable giving throughout the 2018 season, per the MiLB Charities Report which was released last week by the league. Collectively, MiLB clubs reported over $45 million in cash and in-kind donations, the highest in MiLB Charities history. "To find ourselves now in the top five among all Minor League teams for charitable giving is very special," said Cougars owner Dr. Bob Froehlich. "We are extremely proud of what our Foundation was able to provide to the Kane County community." Of the more than $45 million that was donated, the Cougars contributed $1,014,220 among their various charitable campaigns. The Cougars charitable giving is highlighted by many different programs throughout the year including the Huntington Helping Hand program which provides funds to Blessings in a Backpack, a non-profit organization that mobilizes communities, individuals and resources to provide food on the weekends for elementary school children across America who might otherwise go hungry. Additional programs include the Tangled Roots Give Back Pledge, Make it Count in partnership with Alliant Credit Union, the Al Mueller Memorial Scholarship Fund, the Highland Capital Management grant supporting active duty military and veterans programs as well as the Cougars Reading Club and the Summer Reading Program. Click here to view the full MiLB Charities Report. Moving towards the 2019 season, the Cougars look to build upon their charitable giving with the continuation of "A Million Smiles Campaign." Last season, the Cougars became the first MiLB team to set a charity fundraising goal of that magnitude. Each dollar donated provided a much-needed smile for those in need. Fans can participate in the charitable giving campaign throughout the season by purchasing 50/50 raffle tickets, Pitch in for Charity tennis balls on fireworks nights, participating in the 8th Annual Cougars 5K on May 18, selecting the Kane County Cougars Baseball Foundation, Inc. as their favorite charity on AmazonSmile or purchasing a Legacy Brick to be displayed at the main entrance of the ballpark. For more information on the many charitable programs of the Kane County Cougars Baseball Foundation, Inc. visit www.kccougars.com. The Cougars 2019 season begins on Thursday, April 4 at 6:30 PM against the Clinton LumberKings. Follow the Cougars on Facebook, Twitter and Instagram for updates on tickets and promotions.